Hyundai has released a new ad in the UK, showcasing the Kona Iron Man Special Edition. 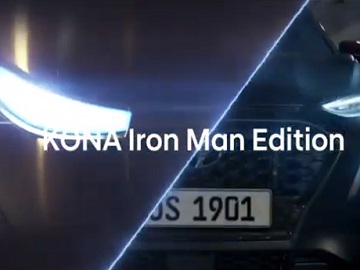 The 30-second spot features a young couple trying to escape an explosion and being “saved” by the Kona Iron Man Special, Edition, which combines, according to the automaker, “the audacious style and technological genius of Iron Man” with “the unstoppable spirit and performance of Kona”. With features like “All Wheel Drive to help conquer the worst road conditions and Forward Collision-Avoidance Assist to help evade dangerous surprises on your drive every day, it’s a vehicle designed to make even Tony Stark do a double take,” states Hyundai. The crossover themed around the Marvel superhero franchise also features electric-blue LED Daytime Running Lights, red armor roof finish with Iron Man mask graphic and matte grey body paint color/finish, red armor accents to front fascia with dark chrome front grille, V-shape hood bevel with Marvel logo, iron-grip dual-tone 18-inch alloy wheels, Iron Man Exosuit cues throughout, on front and rear bumpers, headlight bezels, cladding, skid plate and headlight, Tony Stark Signature dashboard graphic and Iron Man mask on smart key, Iron Man-themed technical graphics for Heads-up Display startup animation sequence and instrument panel, and Stark Industries-branded 8-inch color touchscreen navigation interface. The limited-run Kona Iron Man Edition will go on sale in the UK from 1st March, priced from £27,995.